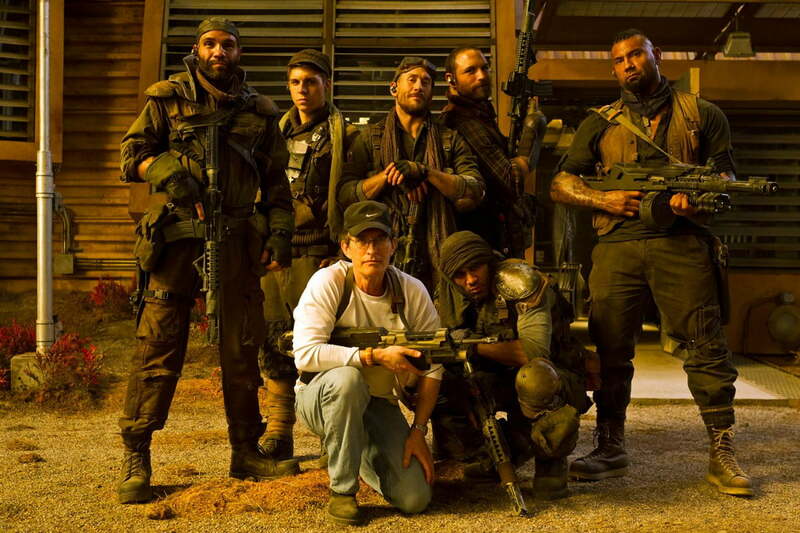 Director David Twohy and some of th emercenaries hunting Vin Diesel's Richard B. Riddick. Riddick writer/director David Twohy isn’t a guy you want to bump into in a dark alley. He’s got some dark impulses, as his continued work with interstellar bad dude Richard B. Riddick demonstrates. 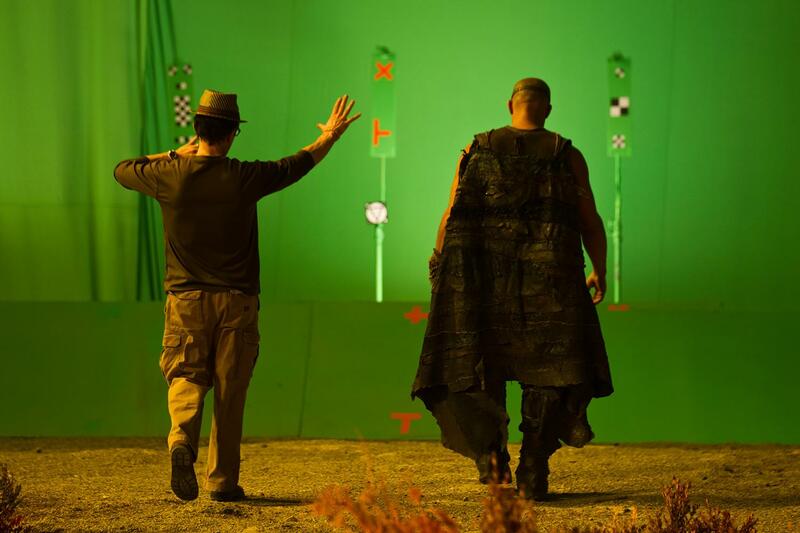 Twohy freely admits that he put some of himself into the character as Riddick came together. Twohy chuckles at the thought, but he’s on to something here. There’s a very primal appeal to Riddick as a character; he feels more like an unstoppable force of nature than a mere tough guy. That’s not quite accurate though. Natural forces ebb and flow according to universal laws. There’s no thought to a raging storm; it simply happens. Riddick, on the other hand, rarely acts without thinking. He’s not quite compassionate, but he’s not overtly sociopathic either. “He is a killer with a code, and that’s more important to us than a killer with any kind of compassion. Sometimes he has no compassion; survival is paramount within him,” Twohy explains. It’s that aspect of the character that led to the recently released Riddick‘s script changing in one particular scene. The script originally had Riddick sneaking into a bounty hunter camp and killing one of the mercs in kill blood. After a brief dialogue exchange, Riddick was supposed to jam a knife into the merc’s brain. That creative decision didn’t fly with the star, who has been inhabiting this character since 1999’s Pitch Black. He knows Riddick better than anyone, and that particular moment seemed out of character. The level of input that Diesel has now versus back in 1999 when Pitch Black first came together is dramatically different. Riddick is the third movie in Twohy’s series, picking up where the story in 2004’s The Chronicles of Riddick left off. Diesel’s involvement escalated with each successive release in the series (video games and other spin-offs included). He even waived his fee for appearing in The Fast and the Furious: Tokyo Drift in exchange for the Riddick rights. Riddick’s path from concept to finished product is an unusual one. Twohy and Diesel teamed up early on in the process to seek independent financing for the new movie after Universal made it clear that it was out of the Riddick business. For Twohy, it was sort of like returning to that time in the late ‘90s when he was struggling to get another Riddick movie made. Unfortunately, The Chronicles of Riddick failed to find an audience when it released in 2004. It wasn’t a total bust, box office-wise, but it wasn’t the sort of success that Universal needed to see to justify taking the franchise further. So once again, Twohy found himself working to find independent financing for a sci-fi movie about a dangerous fellow named Riddick. “[Riddick] was just me with Vin in his kitchen coming up with a verbal gameplan,” Twohy says. The two developed the story together, after which Twohy wrote a spec script that he then successfully sold at the Berlin Film Festival. When he came back to the States to find a U.S. distributor, the unlikeliest of candidates stepped up. In many ways, Riddick feels like a bigger movie than Chronicles. The scope of the 2004 effort covered a wider swath of territory, but the stakes in Riddick’s more personal survival story fit the character well. Part of the success comes from Twohy and Diesel’s creative approach, which is a process of paring down rather than building up. The existing mythology that Twohy refers to is the thread tying together not just these three movies, but the multimedia universe that includes two video games, an animated feature, and a motion comic. He and Diesel have an elaborate big picture plan for Riddick, one that leads into some sort of intergalactic underworld and then, eventually, to the planet of Furya.